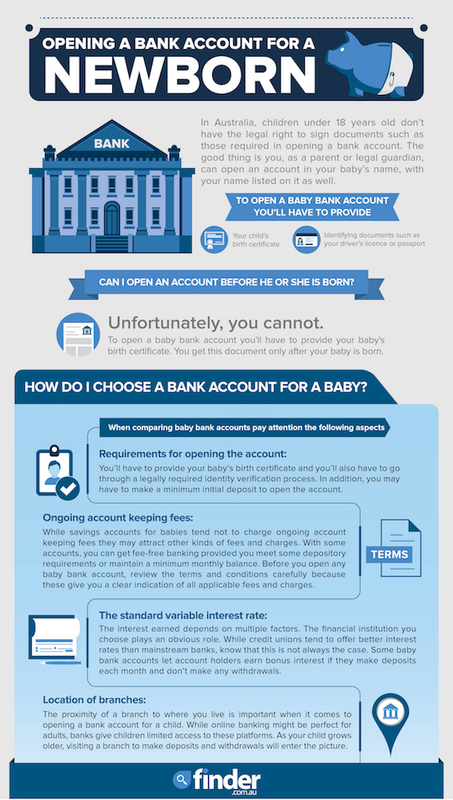 One in two Australian babies have their own bank account, so what do parents need to know about setting one up? Kate Browne is the managing editor at Finder.com.au and she spoke with Feed Play Love’s Shevonne Hunt about the ins and outs of baby banking and why parents are choosing to create accounts that are just for their kids. A parent or legal guardian can open an account in their baby’s name, with their own name listed on the account as well. Your baby’s birth certificate plus your own 100 points of ID are required to create an account. You can’t open a bank account in your child’s name before they are born. Setting up an account when your child is very young is a brilliant idea. Not only does it set a brilliant intention to save for the future, but it also means they have plenty of years to accrue savings and make the most of the benefits of a children’s bank account. Speaking of which, it’s important to choose a children’s bank account rather than the sort of everyday savings account that is designed for adults. Kids accounts are geared to savings rather than frequent transactions, so they have benefits built in that maximise kids’ savings. They don’t tend to charge an account-keeping fee and often offer bonus interest as well. BankWest, the Commonwealth Bank, Suncorp, Bendigo Bank, all offer accounts specifically designed for littlies. You can compare their rates and restrictions at Finder.com.au. Kids’ accounts may come with some depository requirements. They may also have restrictions on withdrawals because they’re really designed to be a place for kids to ‘park’ savings for the long term. Having a bank account is an excellent way to help your child get a grasp on money. That seems like a brilliant idea to us!